MANILA, Philippines—Fun runs, kite-flying events, and goodwill luncheons—these are but some of the festivities to expect as Checkmyschool.org (CMS) officially opens Check N’ Run, a nationwide synchronized validation of public school data, on 20 August. Check N’ Run aims to enhance the integrity of information reported on the Department of Education’s (DepEd) Basic Education and Information System (BEIS) through the involvement of end-users and community members. The BEIS start-of-school-year inventory records data on enrolment, personnel, textbooks, classrooms, classroom seats computers, national test results, toilet, and budget—all of which are consolidated yearly by the 31 July cut-off date. Check N’ Run will convene CMS volunteers in 250 pilot schools in 13 areas nationwide to simultaneously check the most recent set of BEIS data against actual conditions in their respective schools. The results of the validation will be uploaded on the CMS website (checkmyschool.org), where DepEd officials, as well as other citizens, can remotely access them. Copy of the school’s validated data are also posted in a tarpaulin at the most prominent area of each pilot school for the public to see. Kicking off the synchronized school data validation are a series of activities, which include: (a) Fun Run at Araullo high school, Manila on 20 August; (b) Fun Run at Plaza Luz, Pagadian city on 20 August; (c) Kite Flying at Paseo del Mar, Zamboanga city on 28 August; (d) Merry-Making at Tacloban city convention center on 24 August; and (e) Lunch for a Cause at West Visayas State University Function Hall, Calinog, Iloilo on 24 August. For a full list of Check My School activities, visit the website or Checkmyschool.org Facebook fan page. The synchronized activity will involve representatives from local school boards, government agencies, the private sector; and citizen volunteers, including parents, teachers, and public school students. 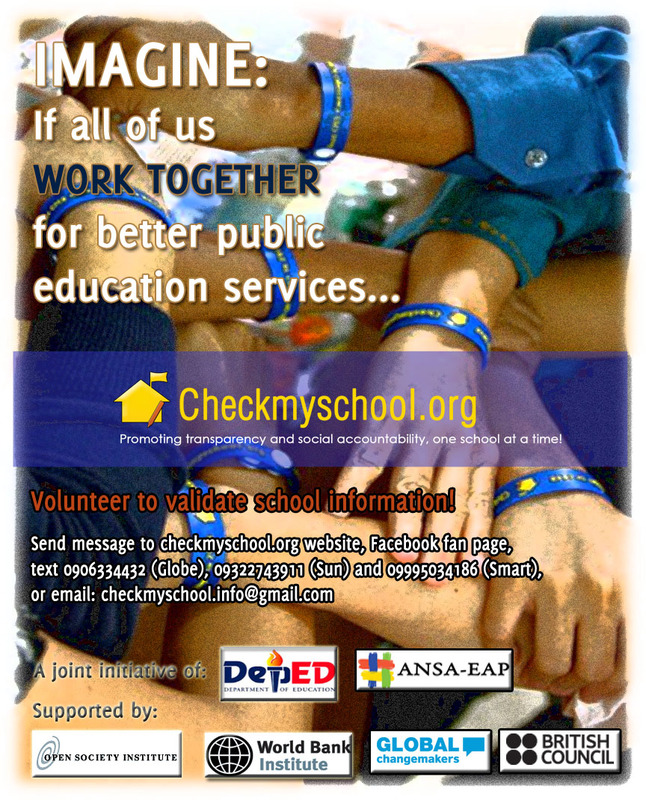 Checkmyschool.org is an information and communication technology initiative which combines a website facility with community mobilization to provide easy and reliable access to information. Its purpose is to promote transparency and social accountability toward better service delivery in public schools nationwide. This project is a joint initiative of the Department of Education and the Affiliated Network for Social Accountability-East Asia Pacific (ANSA-EAP), a regional networking facility housed in the Ateneo School of Government. It is supported by the Open Society Institute, the British Council’s Global Change Maker, and the World Bank Institute. For more information about the initiative, visit the website at www.checkmyschool.org or the Facebook fan page, Checkmyschool.org. Hello everyone, it’s my first pay a visit at this site, and paragraph is truly fruitful in favor of me, keep up posting these articles or reviews.